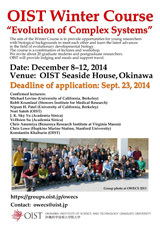 The aim of the OIST Winter Course "Evolution of Complex Systems" (OWECS) is to provide opportunities for young researchers with biological backgrounds to meet each other and learn the latest advances in the field of evolutionary developmental biology. The OWECS is a combination of lectures and workshop. We invite about 20 graduate students and postgraduate researchers. The sponsor (OIST) will provide lodging and meals during the course and support travel for those without funding. Your comments, problem reports, questions are most welcome! OIST will handle the logistics of accommodation, travel, and meals for all participants. OIST will also help with arranging visas when necessary.